HAM! I've gotta try that! I'd LOVE to see what they release for Yule. "Yule Log", "Wine", "Chicken!" Yumm, I have just lost my appetite. Do they expect anyone to actually drink HAM FLAVOR??? EWWWWWW. On the new profile of Kiki Strike it says your location is Afghanistan... I'm sure that is NOT true. What next? 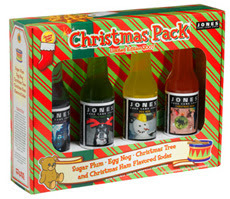 Turkey flavored soda for Thanksgiving? Still, the sodas might be good. You never know. All of you know of my lack of the ability to save money, so my sister and I are BOTH paying half for the Christmas Soda pack! We have agreed to split each one, and we have pledged to drink every drop of our shares on Christmas day! When is sushi going to be there? I too love vegitarianism! wow. do they think someone will ACTUALLY drink HAM flavored soda? I think they just wanna give a twist into christmas. 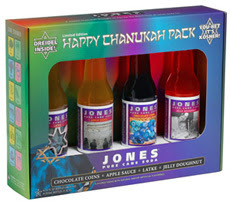 I celebrate Hannukkah and I think those flavors are MUCH better than the other ones. exept for latkas. now what are they gonna make? these are the questions that taunt me. ha ha MWA ha ha. what an intresting idea. I'll leave it at that.